An MFA thesis book by Andrew Ringler. Produced in 2016 as a requirement of the degree of Master of Fine Arts at the Dynamic Media Institute of the Massachusetts College of Art and Design. Increasingly, designers are building interfaces that minimize clicks, confusion, and time all with the presumption that this benefits the user.This narrow design focus leads to the creation of experiences that ignore vital human needs like: sensory experience, socialization, challenge, and learning.This thesis pro- poses a design philosophy and demonstrates realized works that return these vital human needs to the design process, ultimately creating more enjoyable and satisfying experiences for users. The prominent interaction design philosophy of our time can be summed up in the title of Steve Krug’s book Don’t Make Me Think. Humans have evolved to seek out efficiency and designers have exploited this to create what has been termed “frictionless” experiences. As an experience designer, attempt- ing to remove all friction can lead to efficient interactions, but can also lead to experiences that are merely addictive (Facebook, Netflix Streaming, and Candy Crush), yet unsatisfying, vacuous, and boring. This thesis highlights the importance of providing a variety of challenges in the user experience, including physical and intellectual challenge and the act of learning. Additionally, this thesis explores challenges introduced through social engagement, such as: interacting with strangers and performance in front of others. Designing with these goals in mind allows designers to create experiences that users find more enjoyable, engaging, satisfying, and fun to interact with. Many designers would argue that “reducing friction” is a valid technique for both initially engaging and keeping users. My research and projects question this assumption and propose that we can keep users engaged while simultaneously challenging them. As Mihaly Csikszentmihalyi has argued in his seminal work Flow: challenge is a vital human need.Through careful consideration of the process of learning and through consideration of the level and nature of challenges, creating engaging and simultaneously challenging experiences is a possibility. The themes of creation, collaboration, and learning tie together this thesis, the work examples within, and its philosophies of experience design.The process of creating new things, new ideas, and new experiences is extremely fun, rewarding, and is an act of learning and personal growth. The projects in this thesis facilitate the process of creation by providing users with novel opportunities for creation.They do so while also creating holistic sensory experiences, engaging users in process of learning, socialization, and with physical and mental effort. Including such concepts during the design process ultimately creates experiences that are more enjoyable, engaging, and satisfying to their users. This thesis not only presents a design philosophy, but also documents many realized projects that were created using it. 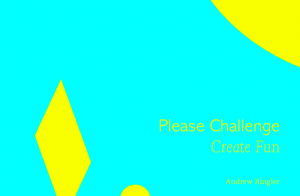 Please create something and challenge yourself, you will have fun.